Catalyst has partnered with Clausehound to bring start-up-focused legal resources to our community. Clausehound assists entrepreneurs, early-stage start-ups, and small businesses to draft legal documents, helping them to be more efficient and cost-effective. Clausehound provides free online access to over 150 agreements and tens of thousands of legal clauses, contracts, news articles, and lawyer commentary. We asked them a few questions so that you could get to know them a little better. Why are you looking forward to being a part of Catalyst137? We’re interested in being part of Catalyst137 because of the opportunity to work directly alongside other passionate entrepreneurs, and get their input on how we can best shape our product for their use. Catalyst is home to numerous high-tech businesses, and this will provide a fantastic opportunity for everyone to learn from one another and for Clausehound to continuously improve the way we support entrepreneurial growth. How will your on-site services benefit tech start-ups? Clausehound will provide credits to be used by resident start-ups at Catalyst to acquire legal agreements, offer discounted review services by our affiliated lawyers, and regularly provide the community with learning materials to enable companies to perform their own legal drafting. What is it about the Waterloo Region that draws you to this project? Waterloo Region is the pinnacle of the technology space in Canada. 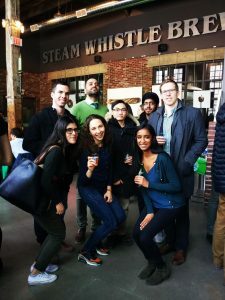 Clausehound’s CEO, Rajah, is a graduate of the University of Waterloo and Clausehound continues to recruit students and graduates from the University. Over the years, nobody has spent more time at Mel’s Diner, or has taken more tours of the Brick Brewing Company, than Rajah.